Background: Investigate how the Teaching Marsh was created, go to the CCRM Homepage, or contact us directly for more information. Visit the Marsh: Take a virtual visit to the Teaching Marsh through our interpretive, interactive map - point and click for more information. Obtain directions to the VIMS Campus where the Teaching Marsh is located. Tours are provided only on special public event days. See the creation of the teaching marsh. Hidden Diversity : Learn about the value of marshes, view interpretive kiosk information found at the marsh site online,or try your hand at our Natural Treasures online wetlands game - point and click to find out if you have the correct answer! Wetland Plants: Browse here for a more in-depth look at plants found in the Teaching Marsh, a list of salt-tolerant native perennials, critters found in the marsh, and an online guide to salt and brackish marsh plants. 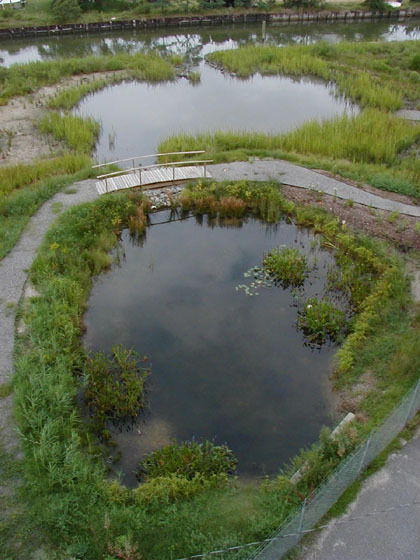 Other Marsh Links: Find more information from the Center for Coastal Resources Management Wetlands Publications list and links to other features and structures you may see while touring the Teaching Marsh such as VIMS facilities and buoys in the York River.